The L.L. 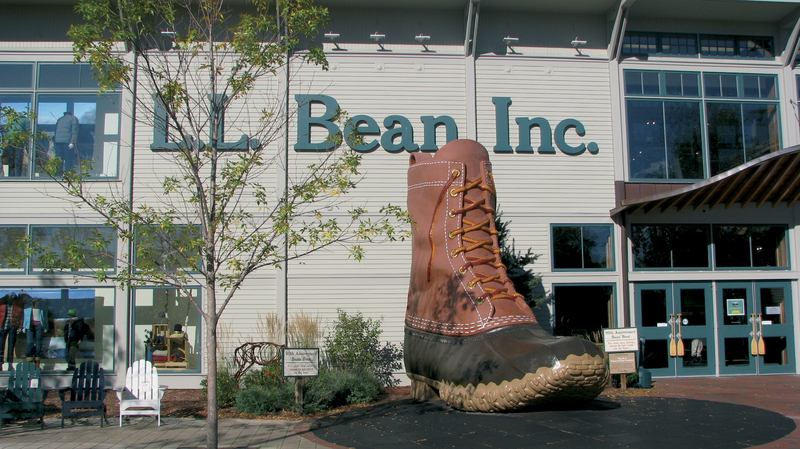 Bean flagship store in Freeport, Maine. The Pine Tree Development Zone program offers eligible businesses in Maine the chance to greatly reduce, or in some cases, virtually eliminate state taxes for up to ten years. Eligible businesses include firms engaged in biotechnology, aquaculture/marine technology, composite materials technology, environmental technology, advanced technologies for forestry/agriculture, manufacturing, IT and financial services. MTI awards research and development money to companies and non-profit research organizations to support the commercialization of new technology, products and services. Grants and loans are made on a competitive basis and support efforts in technology. Programs require a 1:1 cash match, and are awarded based on scientific or technical merit, commercial feasibility, and potential for economic impact to the state. MAINE RURAL DEVELOPMENT AUTHORITY – Provides financial assistance to borrowers or communities to help develop/redevelop new or underutilized commercial industrial properties. The program provides funding of up to $500,000 for these purposes. MAINE SEED CAPITAL TAX CREDIT – Equal to 50% of a qualified investor’s investment into a qualified company. A certificate will be issued by FAME to the investor and can be used as a credit to reduce an investor’s state taxes at a rate of 25% of the credit in the year of investment, and 25% in each of the following years until fully utilized. For bona fide Private Venture Funds, investments are refundable (cash). NEW MARKETS CAPITAL INVESTMENT CREDIT – An investor making a qualified equity investment in a low-income community business through a qualified Community Development Entity is allowed a credit equal to 39% of the investment over a seven year period. These credits are refundable. Program funds customized workforce training delivered through Maine’s seven community colleges. Grants are available to fund pre-hire, post-hire and incumbent training. At no cost to the company, Maine’s Bureau of Labor Standards provides customized health and safety training, site evaluation and technical support to reduce injuries, illness and worker’s compensation costs. Maine MEP helps small and medium sized manufacturers become more efficient, productive and globally competitive by leveraging resources in the application of new ideas to clients, products and processes in pursuit of profits. Program addresses community and business resource needs by providing funding for operating expenses, equipment, and program materials for workforce training that will benefit low/moderate income persons.